*Managing people is a significant challenge for leaders operating in changing environments. *Natural leadership approaches are determined by factors including style, beliefs and culture. *Leaders need to modify their approach to meet the demands of changing circumstances. *Sample leadership interventions include directing, delegating and coaching. *Leaders can and should develop their capabilities in each of these intervention areas. Leaders are likely to feel most comfortable with management approaches that suit their natural style, beliefs and norms. It's difficult to say whether any particular approach is essentially right or wrong because the suitability of each approach depends on its own unique circumstances. Take, for example, Winston Churchill's leadership style, widely regarded as critical for wartime Britain but unsuitable for peacetime Britain. As a general rule of thumb, I advise that leaders consider what type of intervention is appropriate for (a) individual or team X (b) in Y situation (c) at Z time. This means pausing to reflect on one’s approach to ensure that it matches one’s own intentions and the needs of the situation. *When a crisis happens that needs decisive action to be taken immediately. *When the leader holds critical knowledge lacked by other team members. *When team members are doing a task for the first time and need instruction. *When complex activities need to take place in a coordinated manner. *When there are legal or policy stipulations that must be strictly followed. *Is it appropriate to delegate this task rather than do it myself? *Does the team member have all the necessary information or know where to find it? *Does he or she have the required time, tools and expertise for the task? *What kind of support may he or she need in order to do this task effectively? *What kind of authority will he or she need to fulfil this responsibility? *How will learning gained be applied to enhance future practice? *Those based at a significant geographical distance from the Team Leader. *Those employed in a unique, new or specialist field. *Those engaged in a particularly complex role (e.g. Group, Team or matrix leader). *Those responsible for exceptional levels of confidentiality (e.g. HR). *Topic – what they would like to discuss. *Method – how they would like the discussion to take place. *Outcome – what they would like to achieve by the end of the session. There are lots of books on coaching skills available today but I would recommend John Whitmore’s Coaching for Performance (2002) as a stimulating and practical background text. 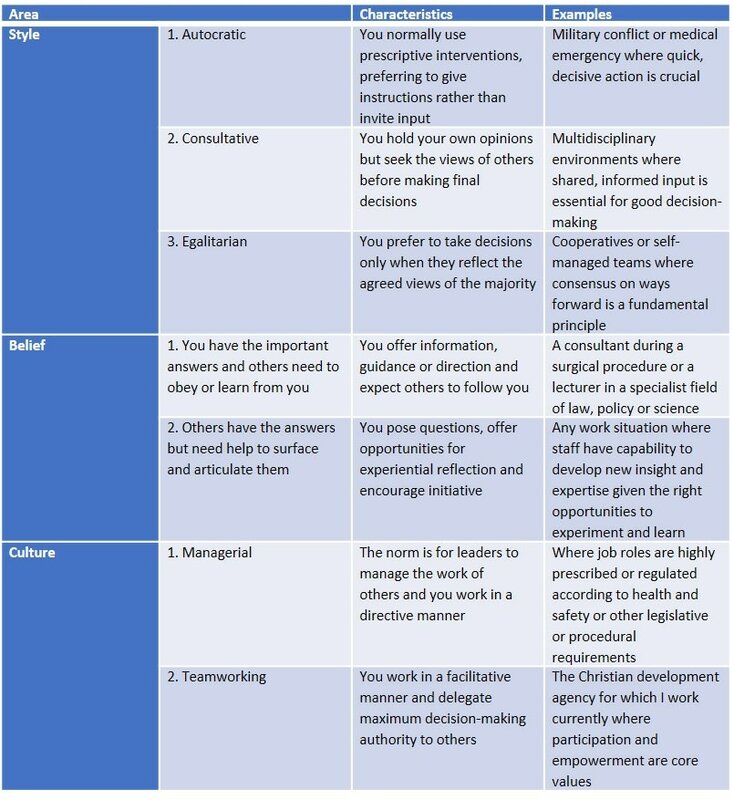 How would I and others assess my leadership approach against the categories described in figure 1 (above)? What are the real-work circumstances under which my approach could be ineffective or detrimental? Which forms of intervention need further development to increase my confidence and competence?